I learned something recently at the European Speed Conference that I thought at the time was very useful to know. I have since had an opportunity to test it and I have found that it stands practical use. I watched a couple of presentations by John Kiely which were on the impact of injury on stability and coordination. He showed a few videos of athletes who had been injured, had recovered to the point of being free from pain and also had had scans and been cleared to resume training by the physios. However, in the videos, John presented a series of tests that clearly showed the athletes weren’t fully recovered. In the videos, the athletes had lost static or dynamic stability when performing relatively simple but controlled movements. So fast forward to my return to coaching. The talks had been interesting and I had stored them away in the back of my mind (John Kiely is an outstanding presenter by the way – if you’re ever looking for someone to present on strength and conditioning at a conference or similar I would highly recommend him). Then, one of my athletes approached me to say that she would like to drop from my sprint group temporarily because she wanted to work on her fitness. She felt she wasn’t fit enough to complete the training sessions. She wanted to work on her endurance. Alarm bells rang. In normal circumstances I would have agreed. After all, she is an experienced athlete, an under 20, and the athletes have to listen to what their body is telling them. However, she can complete an extremely intensive 1 hour circuit training session as well as anyone else. She isn’t blowing hard after a tough 45 minute warm up. Endurance?!?! So, John Kiely swam back into my frontal lobe. The athlete had injured her ankle the previous summer requiring an operation. She was cleared to run and pain free. Sound familiar? It did to me. So I did a few simple movement tests. Very slow walking lunges, hop and plant and so on. Lo and behold, the right ankle was wobbling around like jelly at a kids party. What I’d learned is that if the limb isn’t stable, then the muscles being used to try and keep it stable will greatly increase muscle fatigue. Incorrect muscles being used, too many muscle fibres etc etc. The fatigue only materialised when she started running fast, which was why none of the other exercises or drills showed it up. Endurance work would have embedded poor muscle patterns due to the compensation and could have caused long term problems. At the very least, it would have been limiting for her. Now, I’m no sport therapist, and I am vastly over-simplifying the theory and the practice. I am however, using a sport therapist to help determine when she is ready to return to full training. In the meantime, she is doing some very intense stabilisation and mobilisation work three times a week and it seems to be paying dividends. She isn’t convinced and feels she is missing out on ‘proper’ training, but I’ve convinced her to trust me. This may all be really obvious to many of you. However, the athletes that John was showing in the videos were world class athletes cleared by professionals to resume full training. So, I feel justified that normally I wouldn’t have considered this in the past. But now, when anyone returns from injury, we will run them through some slow movement tests which shows up the stability issues far better than when they are running, when things are happening too fast for me to see it. I hope this helps some of you. If you have any questions, comment below on the bottom of the page and I’ll answer them. If there are any of you out there that would like the workouts, then let me know and I’ll send you what I do. Lee Ness is a UKA qualified Event Group Coach for Sprints and Hurdles, the Head Coach/Sprint Coach at City of Salisbury Athletics and Running Club and Track and Field Team Manager for Wiltshire Athletics Association. 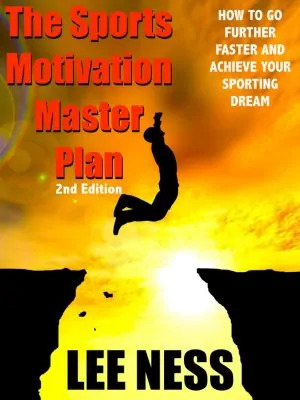 The book,The Sports Motivation Masterplan, is a support guide for athletes and parents, helping them with the role of mentor through their journey from young aspiring athlete, to elite performer. Buy it on Amazon USA. Buy it on Amazon UK.